At the Science Faculty of the University of Amsterdam there is an impulse to expose students to entrepreneurship early on in education programs. In 2012 Dr. Pernette Verschure, Associate professor at the Swammerdam Institute for Life Sciences at Science Park, contacted Erik Boer Director of ACE, to develop entrepreneurship teaching for UvA BA students in Biomedical Sciences. 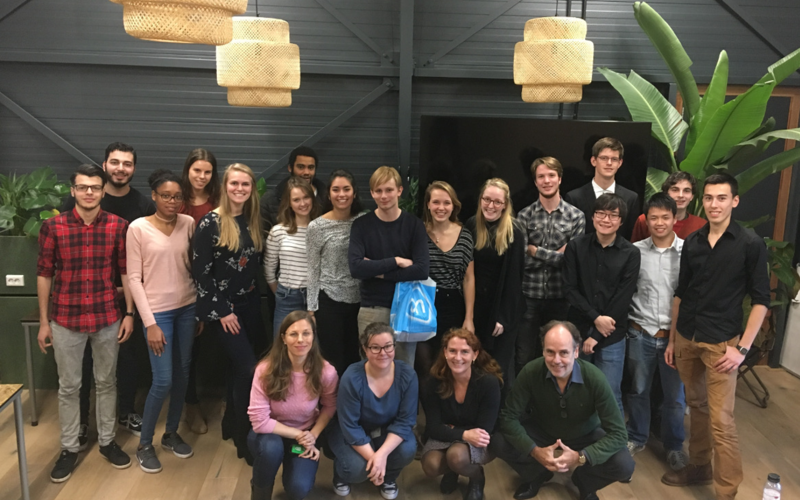 This effort resulted in an entrepreneurship crash course for students following a specialized Frontiers in Medical Biology track at the University of Amsterdam. This BA entrepreneurship teaching – running yearly since 2012 – is specially designed for medical biologists to illustrate what it’s like to venture out with their innovative ideas. Bart Sutorius, business trainer and coach in business development, is since the beginning of the course a key person in the organization and education. During the Frontiers in Medical Biology track the students focus on major healthcare challenges of the 21st century. With a series of workshops such as business model canvas and value proposition, given by Bart Sutorius, R&D by technology transfer agent (IXA) Mercedes Tuin as well as workshops by an IP-expert and a venture capitalist, the students are exposed to basic entrepreneurship expertise. Also, the students are exposed to several inspirational speakers from successful entrepreneurs in biomedical science. The entrepreneurship teaching sets the scene for the students to work on a business assignment. In this assignment the students are asked to think ‘out of the box’ and set-up a business model for an innovative startup, directly or indirectly related to health. Over a couple of weeks the students are coached to actively practice their entrepreneurship skills. In complete ACE style, the course is concluded with an end pitch of the business proposals at Startup Village Science Park. In the 2017 Entrepreneurship course, ACE’s portfolio manager Darya Krasilnikov sat on the jury to decide who presented the best business proposal. The winning team was EstroClean, with a proposal to be the first to bring an efficient, affordable and sustainable solution to harmful estrogen accumulation in our environment. The unique approach of EstroClean aims to optimize bacterial species to break-down harmful compounds in the wastewater. The entrepreneurship training helped the students to realize the steps they need to take in order to start and expand business worldwide, by locating stakeholders and getting them involved. Other business proposals included micro-needle patches for HIV therapy, an antibiotic resistance prevention program and a cardiac alert monitor band.